Play the role of Sonic once again and join in with his friends to stop another one of Dr. Robotnik's plan to rule the earth in Sonic the Hedgehog 3! Also known simply as Sonic 3, the game begins shortly after the second game. In this game, Dr. Robotnik's massive space station known as the Death Egg, crash-landed on a floating landmass. There the story gets even more interesting when Dr. Robotnik successfully duped Knuckles and tricked him into fighting the protagonist Sonic and his friend Tails. Gameplay-wise, the game starts with either Sonic or Tails (depending on the player you choose). You must take control of the protagonist and go on a 2D side-scrolling adventure to stop Dr. Robotnik and win against Knuckles. Sonic the Hedgehog 3 is an online SEGA game that you can play at Emulator Online. This free Sega game is the United States of America region version for the USA. 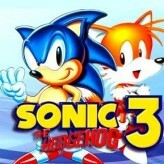 Sonic the Hedgehog 3 is a single title from the many arcade games, action games and sonic games offered for this console. If you enjoyed playing this, then you can find similar games in the sega games category. Sonic the Hedgehog 3 game is from the various retro games on the site, and there are more games like this, including Sonic Mania Edition, Sonic & Knuckles + Sonic the Hedgehog 3 and Sonic Advance 3.